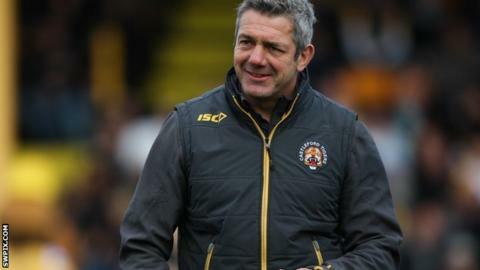 Castleford coach Daryl Powell says his team have gained a lot of knowledge from players that featured in Tigers' last Challenge Cup winning side. Cas face Leeds Rhinos at Wembley on Saturday looking to win the competition for the first time since 1986. Powell, a Castleford fan, attended that 15-14 win over Hull KR 28 years ago. "We've spoken to a lot of the guys from that team on their experiences and we have got a lot from that," he told BBC Radio Leeds. "Like ourselves they were underdogs that day and they managed to carve out a victory based on a closely knit group of people. "I thought it was a really special achievement and a great day for the club and I think we have given ourselves a great chance to do something special now. "It would be outstanding for the club and for this group of players." Powell has turned Castleford's fortunes around since taking over from Ian Millward in May 2013. The Tigers, who finished 11th last season, are guaranteed a top six-finish this season and are in the final of the Challenge Cup for the first time since 1992, when they were beaten by Wigan Warriors. The former Featherstone coach, a Cup winner as a player with Leeds in 1999 and losing finalist as Rhinos coach in 2003, says it is important for his players to maintain their composure. "Ultimately the players have to deliver an outstanding performance and you can not do that if you are too hyped up," he said. "We need to keep our preparation relaxed and make sure we feel prepared when we walk out there." Powell added: "They tend to be quite surreal occasions. If you win it is very strange because there is so much emotion involved."